When one hears Kama Sutra Massage oil, one might think of hot monkey love. Not me. I think ahh soft hands and feet and relief to my reptilian scaly dry skin. I have Scleroderma and my most severe symptom since 1992 had been Raynaud’s. Raynaud’s causes the sympathetic nerves surrounding blood vessels to constrict so much, it stops blood flow. The most common place affected by this are the fingers and toes, but it can affect any blood vessel in the body, but that is rare (so if you have Raynaud’s, take a breath, relax and just keep taking your meds as directed.) Raynaud’s is also the “R” in CREST syndrome- but that’s a whole other article. Because of years of attacks and periods of denial when I did not take my meds as directed, my hands are covered in scar tissue. The sebaceous glands which keep moisture in my hands appear to be destroyed. My skin is painfully dry. I have used paraffin baths, Vaseline, Amlactase and more brands of lotions than I can count to try and keep my hands from looking and feeling like steel wool. Then I found Kama Sutra Sweet Almond Oil about 4 years ago. It is the only thing that keeps my hands feeling like hands. I have used other products in its place when I run out and within 36 hours, my hands are back to being dry and snaggy. 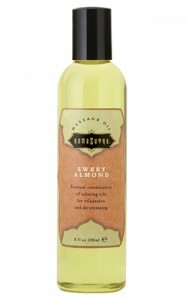 I use the massage oil from http://www.ravenwoodspa.com/ they have scented and unscented. It has avocado, castor, olive, and grapeseed oil. Bonnie most people who think they are allergic to wool are actually allergic to the chemicals used to strip lanolin and plant material off of the wool. This process also leaves the wool more abrasive. My second mom is allergic to lanolin, but most people I’ve met who say they are allergic to wool have no problems with items made from hand-spun yarn. Also the breed of sheep the wool comes from makes a huge difference, some breeds have wool finer than cashmere. Sorry, I come from a fiber family and was raised learning all about this. I just hate seeing wool get a bad reputation due to chemicals. I have a question…..how strong is the almond scent? I am a chronic severe asthmatic with hyper-reactive lungs to any sort of perfumy scent, but b/c I am high dose steroid dependent and wash my hands like 800 times a day, I am gator skin also. I would love to try that but am afraid of the scent…..can you please tell me how strong it is….it sounds wonderful! my mother 2was plauged with dry skin- so am i. she couldn’t use most lotions- neither can i. actually, now that Avodeerm and Neutrogena have changed their focus i can’t use any lotions anymore. i have discovered that not only am i allergic to lanolin (like most of the population. it’s why wool itches when you wear it) but i am also VERY allergic to glycerin, which also happens to be in many other products besides lotions. the way i discovered my glycerin allergy was the day when i lathered myself all over with it and ended up 5 minutes later in the shower DESPERATELY trying to wash it OFF. i had a rash that tormented me for days afterwards. i’m wondering- does the kama sutra oil contain glycerin? right now i’m using canola oil and it seem to be doing OK, but if i can find something better i’ll gladly use it. Doctors always look at me funny and don’t seem to know what CREST is. My grandmother had crest. I have fibromyalgia and am borderline lupus. My 8yo daughter has eczema, but the doctors have yet to find an allergy causing her outbreaks. We will have to try the oil for her. There’s an old-fashioned trick for going to bed with goop on your hands — wear gloves. The old-fashioned white cotton gloves that ladies were required to wear were perfect for this, but anything that confines the goop to your skin should do the trick. May I recommend our Scrubz natural body/face scrub too. Not only will it moisturize your skin with 8 natural botanical oils, but it will exfoliate the dead skin while cleansing, and stimulate muscle tone, blood flow and lymph fluid movement by the means of a gentle massage. It is truly a 4-1 product, perfect when there are very few spoons left. The best compliment we got from a woman with RA and Fibromyalgia was that we “gave her her femininity back”. The natural, gentle exfoliation helps reduce the appearance of wrinkles, age spots and scarring, too. Wow, what a wonderful tip! I don’t have scleroderma, just dry skin from diabetes, heart disease, and some side effects from CVID, bronchiestasis, and lots of Rxs. I found ScarMassage by Heritage Products, made from an Edgar Cayce recipe, and wonder if it might help. I’ve used it for an abdominal scar, and it relieves the itching & pulling from deep scars, as well as making the scar much less visible. Lately, I’ve been using it on my ankle, where I have breakthrough bleeding and pain (from circulatory/Rx issues.) A PT told me it was the best thing for deep burns he’d ever seen. It does have camphor in it, so you don’t want to get it in your eyes or use near mucous membranes. Ask the Health food store to get it for you. Karen, where do you get the Kama Sutra oil?